You must be 25 years old to rent this condo. This beautiful condo has 3 bedrooms, each with en-suite bathrooms. It can comfortably accommodate up to 7 people. The master suite has a king size bed with a luxurious mattress, a walk-in closet, a jacuzzi bath tub, and a separate luxurious walk in shower. There are two separate guest suites, both tastefully furnished with comfortable beds. You will have the benefits of Wi-Fi, cable and local telephone service for your convenience. Ft. Morgan is the place to be on the Gulf Coast, famous for having the best fishing and the perfect white sandy beaches. 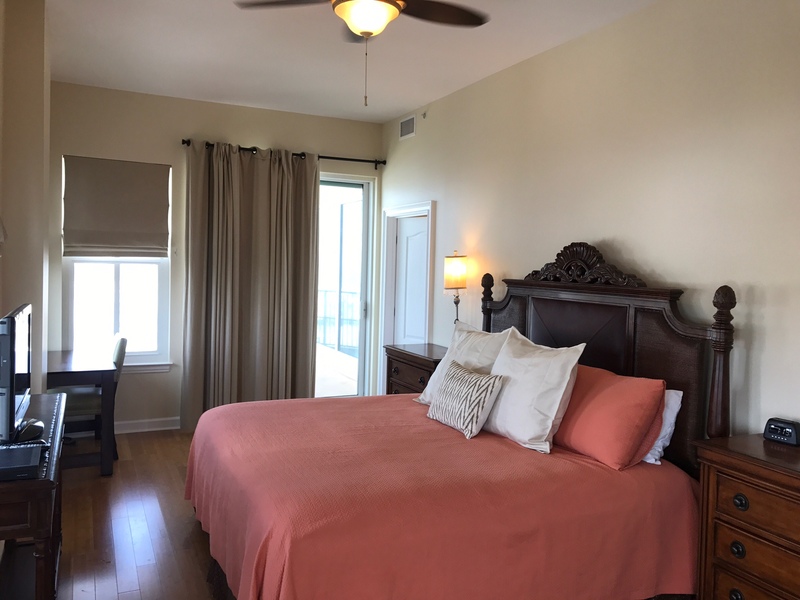 This condo is located only 20 min from the town of Gulf Shores with the conveyance of restaurants and fishing marina close by without having to fight the traffic to cross the street. 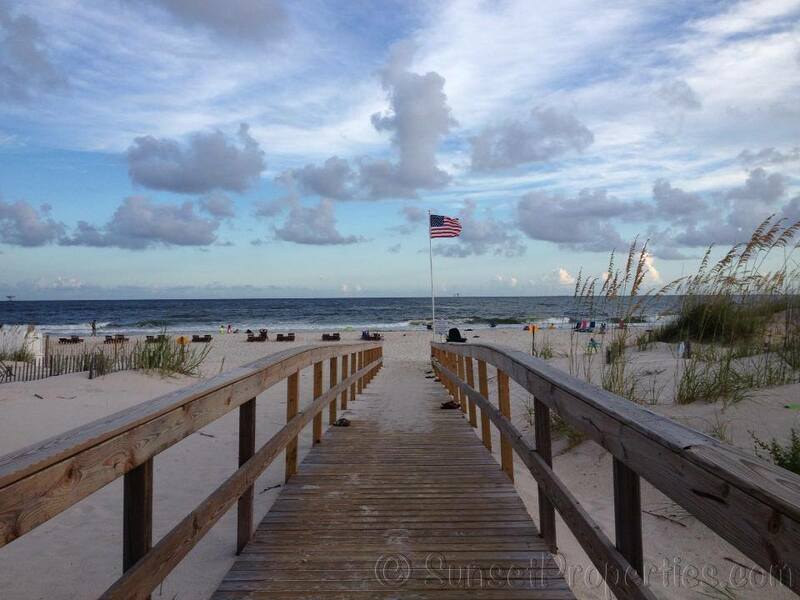 Walking distance is only 300 yards to the white sandy beaches the Gulf of Mexico is famous for. Start your day with breakfast on the balcony, take a swim in the pool and enjoy a good glass of wine while overseeing the beautiful view this penthouse condo offers. These are all ingredients for a wonderful vacation at Indies 701 and you can have it all. "Awesome. Top Corner unit. Best view in the gulf. Who decorated this condo? Can they come to my house?" "This was our second year at Indies 701 and we signed up again for 70 days next year. The condo is beautiful and the view from the wrap-around deck of Mobile Bay and the Gulf are fantastic. Sunset Realty represented by Becky Smith and the maintenance of Mark are outstanding. the only negative is the sofa needs to be replaced. We thank the owners for allowing us to stay in their home." "Thank you so much for the review and for staying with us year after year! Fort Morgan is the perfect place to rest and enjoy the mild winters! " "Very nice place at a very reasonable price! The unit was well kept, but there were some basic maintenance issues that were a little neglected. All the door hardware throughout the condo was loose and felt cheap. The sliding glass door in the living room was very difficult to open/close. The property management company was very responsive, and it was a nice quiet weekend." "Thank you so much for taking the time to leave a review of your stay at Indies 701. We will certainly let the owners know about the hardware. As for the door, most of those are made that way because of the high winds we sometimes experience down here. Give us a call when you are ready to book your next stay!" "701 was absolutely beautiful! The location was amazing! The accommodations were very spacious and beautiful. The Master Bedroom and bathroom were PERFECT. The desk in there was a great help since I had to work on this trip. I love being on the top floor and viewing the beautiful beach and hearing the waves at night! The wrap around balcony was amazing! The only comments would be that the balcony needs more furniture and more towels But all in all, it was a wonderful stay! Will rent again. " "YAY!!!! LOVE LOVE to hear this! We hope you'll be able to come back soon!" "We stayed 70 days at the Indies 701 on Fort Morgan. It was our eighth year in a row on the Gulf and it was the best. We already signed up for 70 days next year." "That is fantastic!! We love our repeat guests! We look forward to seeing you next year!" "We loved the condo and it was well equipped. The view was gorgeous! The kitchen was fabulous and it was a great place to retreat to after a long day in the sunshine! " "Yay!! So glad you enjoyed your visit and hope you'll come back out soon!!"